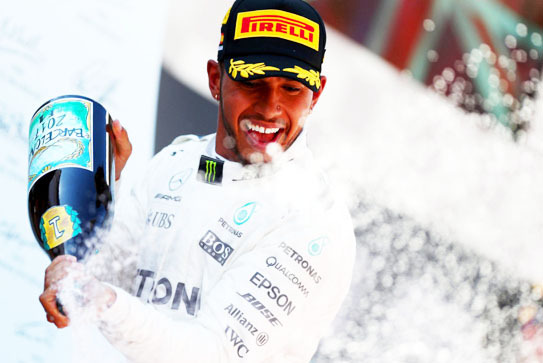 Mexico City, Oct 30: Britain’s Lewis Hamilton, driving for Mercedes, has won the world Formula One championship for the fourth time, coming in ninth in the Mexican Grand Prix, which was won by Dutch Red Bull driver Max Verstappen. Germany’s Sebastian Vettel, in a Ferrari vehicle, who was Hamilton’s nearest rival for the championship on Sunday, came in fourth, Efe news reported. If Vettel did not win the race, it was enough for the 32-year-old Briton to come in fifth to garner the overall title yet again after his wins in 2008 driving with McLaren and in 2014 and 2015 with Mercedes. Finishing second on the Mexico circuit was Finland’s Valtteri Bottas, driving for Mercedes, and in third place was his countryman, Kimi Raikkonen – Hamilton’s Mercedes teammate. Vettel had snagged pole position on Saturday for the Mexican Grand Prix after a hard-fought battle with Verstappen, while Hamilton started from the third spot at the Hermanos Rodriguez Autodrome in Mexico City. Hamilton had a virtually insurmountable 66-point lead over second place driver Vettel, who had 265 points, with just three races to go in the 20-race season. In Mexico City, Esteban Ocon with Force India came in fifth, Canada’s Lance Stroll (Williams) was sixth, Mexico’s Sergio Perez, also with Force India, was seventh, Denmark’s Kevin Magnussen with Haas was eighth, and Spain’s two-time world champ Fernando Alonso, with McLaren-Honda, was 10th. The next F1 contest, the Brazilian Grand Prix, will take place on November 12 at the Interlagos raceway in Sao Paulo. Self-driving golf carts a competition to Google car?